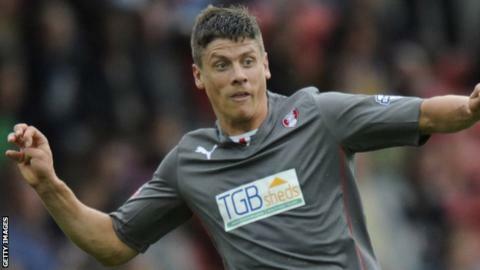 Alex Revell's stoppage-time header saw Rotherham come back from two goals down to get a point against 10-man MK Dons. Matthew Kennedy converted Ryan Hall's pass to give the Dons the lead. Brendon Galloway was sent off for a second booking three minutes after the break, but his team-mate Izale McLeod doubled the visitors' advantage. Rotherham made their numerical superiority tell though, as first Michael O'Connor scored, before Revell headed in Kari Arnason's long throw. "George Baldock shook us all up when his injury happened. We believe he lost consciousness on the pitch, and was stretchered off. "He's been taken to hospital now. He's going to be okay, but he's just a bit shaken up at this moment in time. "I'm so proud of the players today and the football club. Our fans sang their hearts out for 90 minutes, and I think we've all shown you that we're made of better stuff than what people first thought. "The way Brendon Galloway conducted himself, and how upset he is at the moment is great for his development - these are all learning curves." "I think it was a disjointed performance. We never really got going from the first whistle. "There was sloppy play all over the pitch - I can't identify two or three individuals because I think it was all of them. "Obviously we made some changes, and in the second half we had a bit of a go, got back and got a point. "The performance was not good enough but I cannot fault my team for the effort, and spirit, to go on to the end." Match ends, Rotherham United 2, MK Dons 2. Second Half ends, Rotherham United 2, MK Dons 2. Goal! Rotherham United 2, MK Dons 2. Alex Revell (Rotherham United) header from the centre of the box to the bottom right corner. Assisted by Kári Arnason. Matthew Kennedy (MK Dons) is shown the yellow card. Attempt missed. James Tavernier (Rotherham United) right footed shot from outside the box misses to the right. Attempt saved. James Loveridge (MK Dons) right footed shot from outside the box is saved in the centre of the goal. Mark Randall (MK Dons) wins a free kick in the attacking half. Corner, Rotherham United. Conceded by Tom Flanagan. Delay in match Bamidele Alli (MK Dons) because of an injury. Attempt missed. Michael O'Connor (Rotherham United) right footed shot from outside the box is too high. Goal! Rotherham United 1, MK Dons 2. Michael O'Connor (Rotherham United) right footed shot from the centre of the box to the bottom right corner. Assisted by Alex Revell. Substitution, Rotherham United. Tom Hitchcock replaces Lee Frecklington. Substitution, Rotherham United. Wes Thomas replaces Nicky Adams. David Martin (MK Dons) is shown the yellow card. Attempt missed. James Tavernier (Rotherham United) right footed shot from the right side of the box is too high. Attempt saved. Ben Pringle (Rotherham United) left footed shot from outside the box is saved in the centre of the goal. Goal! Rotherham United 0, MK Dons 2. Izale McLeod (MK Dons) left footed shot from the centre of the box to the centre of the goal. Attempt missed. Nicky Adams (Rotherham United) header from the centre of the box misses to the right. Corner, MK Dons. Conceded by Adam Collin. Attempt saved. James Loveridge (MK Dons) right footed shot from outside the box is saved in the bottom left corner. James Loveridge (MK Dons) wins a free kick in the defensive half. Substitution, MK Dons. James Loveridge replaces Ryan Hall. Mark Randall (MK Dons) wins a free kick in the defensive half. Attempt missed. Lee Frecklington (Rotherham United) right footed shot from the centre of the box is too high. Attempt saved. Nicky Adams (Rotherham United) right footed shot from the centre of the box is saved in the centre of the goal. Attempt saved. Alex Revell (Rotherham United) right footed shot from outside the box is saved in the centre of the goal. Attempt blocked. Alex Revell (Rotherham United) right footed shot from the left side of the box is blocked. Foul by Stephen Gleeson (MK Dons). Attempt missed. Ben Pringle (Rotherham United) right footed shot from outside the box is too high. Second yellow card to Brendan Galloway (MK Dons).